Windows 7 has had a pretty good run and like all good things, Windows 7’s time in the spotlight must come to an end. 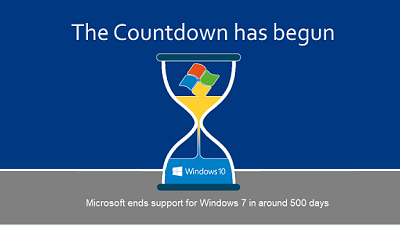 Microsoft is supposed to end support for the old operating system in less than 500 days. Starting mid-January 2020, Microsoft will no longer offer any additional updates or support for the old platform. “Support for Windows 7 will end on January 14, 2020. Microsoft will no longer provide security updates or technical support for devices running Windows 7 operating systems,” Microsoft writes in a page that recommends Windows 10. As Windows 10 is getting better with every update, more and more users are finally upgrading to this version of Microsoft’s desktop operating system. It remains to be seen whether the Windows 7 would be a distant memory or not. According to Microsoft, Windows 7 PCs will stop receiving security updates after January 14, 2020, and you would need to upgrade to Windows 10 to keep your data safe. It’s worth noting that you can continue to use Windows 7 even beyond the end of support date but without any support from Microsoft, your PC will become more vulnerable to security risks. We'll keep this thread updated when updates become available on OUR FORUM.